In last month's CSI Technical Journal, we introduced our new Online Newspaper feature - a much expanded Unfair Advantage® (UA) capability that many have already found quite useful in interpreting, understanding and trading the markets. Economists, market analysts and anyone who makes it their business to follow the markets in today's world economy should find this broad market and econometric coverage helpful and profitable. Since the Online Newspaper is available on the same day as the most recent update, it is easy to see why we refer to it as "Tomorrow's Newspaper Today." This month we would like to tell more about how customers might profit from the correlation studies that are part of the Online Newspaper interface. This study pairs off, in a daily frequency, every world futures market with every other world futures market over the past twelve years, ending with the day of trading last observed. We limited our proving period to 12 years to minimize the chance that underlying market dynamics could have changed significantly from the distant past. The correlation capability permits access to an in-depth analysis of market segments and groups within unique industry classifications. These include Grains, Food and Fiber, Energy, Telecommunications, Electronics, Financials and hundreds of others. The Online Newspaper is accessed through CSI's website following a daily update with UA. It is tied to the website to lessen waiting time and reduce the computing load on individual customers' computers. It allows you to capture this wealth of information on correlated market pairs with little or no waiting. Data files and charts are readily accessible around 9:00 p.m. eastern time, well after today's market data has been posted. Each day after CSI has posted all relevant market data, our website server goes through Perpetual Contract® data on up to 320,000 pairs of commodities involving nearly 800 futures markets. It then computes simple linear correlation coefficients for each pair and sorts them. Those that are most positively correlated and those that are most negatively correlated are separately identified, redundant pairs are eliminated, and a table of all relevant correlation pairs is provided. 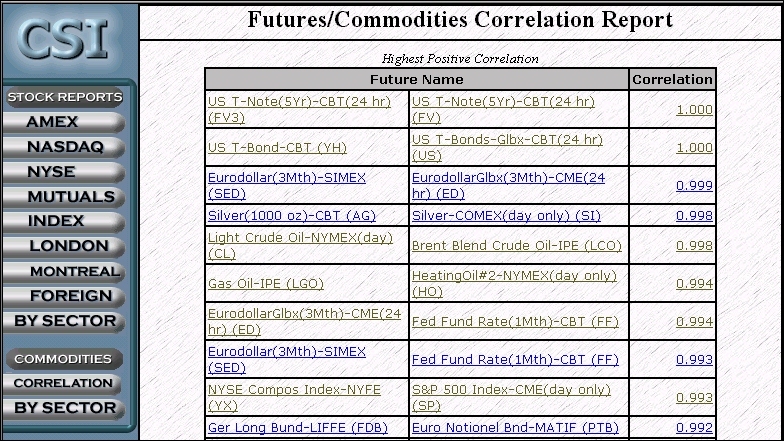 Correlation coefficients are statistical measures of how each member in a pair of markets relates to the other. There are two parts to the correlation coefficient -- the sign and the magnitude. The magnitude, also known as the absolute value, ranges from zero to one and indicates the strength of the relationship. The sign (positive or negative) indicates the direction of the relationship. A value of 1.0 is perfect positive correlation - the two members of the pair move up and down together in unison. If two markets move in exactly opposite directions, then they have a perfect negative correlation, with a correlation coefficient of -1. The correlation tables may show some inconsequential data, such as a perfect correlation between contracts that are essentially the same, e.g. Day-Session T-Bonds and Globex T-Bonds. However, if you look a little farther down the sample list, you'll find weightier data. 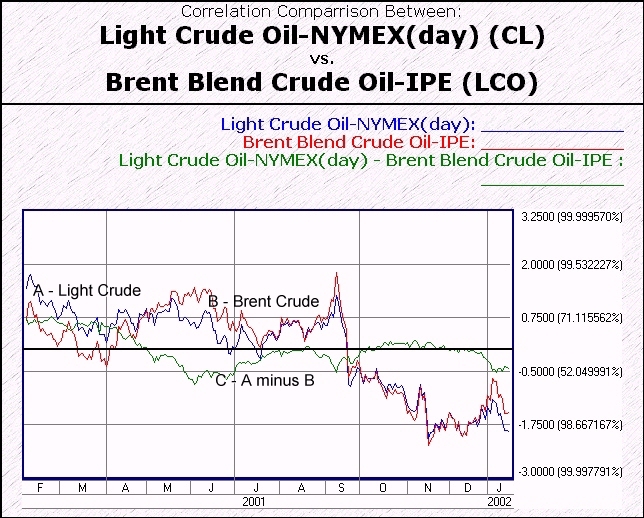 For example, as I prepare this article in mid January, I find a high correlation coefficient (.998) for the pair consisting of NYMEX Light Crude Oil (CL) and IPE Brent Crude Oil (LCO). No big surprise there, but it is important to know that energy prices are in step on both sides of the Atlantic. Other highly correlated pairs include the German Bund with a number of other countries' government securities. Several stock indexes show high correlations with other, as do various grain contracts. Among the least correlated pairs are a few grains with several stock indexes, such as the NYSE Composite Index with Barley (-.934), and gold with stock indexes. A host of currencies round out the list of negatively correlated markets, reflecting the inverse nature of foreign exchange. The correlation tables showing the most positively and negatively correlated markets are likely to reveal several glaring opportunities for profit using spread trades. The tables illuminate inevitable random market distortions that will eventually return to correlated norms. The markets' return to the norm is what will help you earn a substantial profit. How can you use this information to make better trading decisions? First, decide upon your trading strategy. Unless you are trading very specific spreads or arbitrages, you will probably want to be as diversified as possible. The correlation coefficient table sheds light on true diversity of investments. For example, if you take long positions in many markets in an effort to diversify, but all those markets are highly correlated, then you lose the diversification you sought. Trading multiple positively correlated markets or multiple negatively correlated markets is equivalent to pyramiding and serves to amplify your risk. Diversification is best achieved by trading markets with correlation coefficients that are low-magnitude (closer to zero). Click on any pair of markets in the correlation tables to view one-year price charts of the individual Perpetual Contract series and a three-line chart showing sigma values. The example at right shows a pair of markets as they have jointly declined from their average price over the past year. The difference between these two markets is shown in a third graph on the same chart image. Please notice that when market A is above market B, the difference line (C) lies above zero. The opposite is true when B is stronger than A. The trader should watch the difference levels over the period of study, and decide when to activate a given trade. This chart demonstrates deviations from the mean price for each market in the pair (A and B) divided by sigma, the so-called standard error. Line C is the difference between the two values. These lines are color coded in Unfair Advantage. In a positively correlated pair where two markets over the past twelve years have demonstrated a correlation of over 0.90, the trader should be prepared to sell the stronger market and buy the weaker market. A similar profit opportunity is presented when a pair of markets shows a historical tendency to be negatively correlated. In this scenario, opportunities for profit arise when the difference line shows the pair of markets to be moving together. The trader's focus should be to capitalize upon their tendency to move apart. Before embarking upon a paired investment where one market is sold and the other is simultaneously bought (such as might be suggested with the stock index and barley on the correlation table), be certain that a real relationship exists that can be explained. With thousands of possibilities visited, some will emerge as accidental associations that not prove to be fruitful opportunities worthy of investment. If all of this sounds a bit familiar, it may be because you have tried UA's MultiMarket AnalyzerT module. The MultiMarket Analyzer goes even further than these charts and tables in using correlation studies to uncover market opportunities. We recommend you try the program and consult the online manual for more information on understanding intermarket relationships. Although there are never guarantees of success in the financial markets, I believe that there is no safer method of selecting trades than through correlation analysis. Rewards may not be spectacular, but this strategy greatly reduces the risk and adds certainty to investing. The new Online Newspaper and the associated correlation study are web-based services that are available free to all UA users for a period of time. In the future, we may offer the Online Newspaper (Tomorrow's Newspaper Today) and associated studies as a premium benefit for a nominal annual fee. In the meantime, please make extensive use of these new services. We have been busy overhauling our mutual fund database, primarily by inserting dividend and capital gains information that had been omitted. To avoid the lengthy process of amending each affected file in your database, we are making the revised data available on CD-ROM. If you subscribe to the Unfair Advantage stock database and would like to receive this free UA upgrade disk, please drop us a line by e-mail: techsupport@csidata.com, phone: (561) 392-8663 or fax: (561) 392-7761. Thank you!